I’m a sucker for a good time travel story. Most of my favourite works of fiction deal with the concept of time travel, and I can’t seem to get enough of it. So when Marvel announced as part of their Marvel NOW! 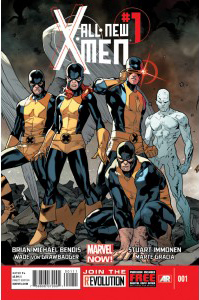 relaunch that All New X-Men would find the original five X-Men; Beast, Angel, Iceman, Jean Grey and Cyclops, taken from the past and brought to the future to help talk down one of their own from committing mutant genocide, my interest piqued. Fortunately for everyone, Brian Michael Bendis sets the stage for what will be one of the most interesting titles in coming months. All New X-Men #1 picks up right after the events of the Avengers vs. X-Men event earlier this year. Professor Xavier is dead, murdered by a Phoenix-possessed Cyclops. This leaves the school renamed as the Jean Grey School for Higher Learning under the leadership of Wolverine. New mutants have been popping up all over the globe, as Cyclops’ X-Men move to start the “mutant revolution”, leaving a trail of regular human-beings in their wake. Wolverine’s X-Men soon discover that desperate times call for desperate measures, as they are forced to retrieve the original X-Men in hopes they would be able to save the mutant race from once again being caught under the prejudices that the series was built on. Bendis brings the feelings of prejudice and fear for the mutant race back on to the table easily. While not allowing humans to be outright assaulting the new mutants, the sense of fear and dread, even to one mutant who can save lives with his touch, is palpable throughout the book. This title may say New X-Men, but these are classic X-Men themes. The characterisation takes a back seat for the first issue, as Bendis first seeks to set up the world post AvX. The only character who is given any real spotlight is Beast. With his opening monologue, we learn that the idea of travelling the space-time continuum was not something he has taken lightly. The rest of the characters take a back seat to action and story – with the notable exclusion of Wolverine, this initial outing seeks to set up events to come rather than showing the characters who will take part. Stuart Immomen’s art, coupled with Marte Garcia’s colouring, gives the entire issue an animated feel. The action panels have a sense of momentum, and his art in the more talking moments gives each event their proper due. While his work may not necessarily stand out, it still looks fantastic, and suits the tone of the book well. All New X-Men #1 succeeds fully in introducing the new status-quo for our favourite mutant family. While the first issue is light on character, its heavy themes, and the set up for the time travelling X-Men gives the coming months much promise for the title. Plus did I mention that it has time travel?